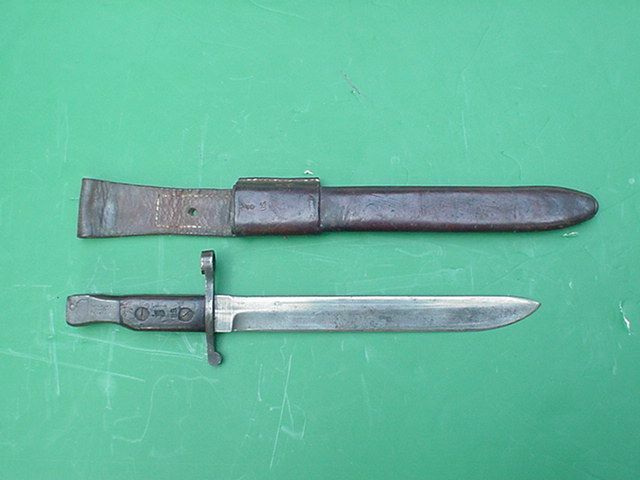 It is britsih and i was wondering about its date etc, on the sheath it is marked rrc 1916, and MKII. the blade is not marked, but at the end of teh hilt it is marked ross rifle company patented 1907.
it has some otehr markings on it 1/1 7 a 4 with a CROWN OVER IT. or issued to her dad who was in in the army in 1959? Are you sure it's not Canadian? It sounds like it could be for the Canadian Ross rifle, which was Canada's standard infantry rifle it was replaced by the SMLE (in 1916 I believe). These were also issued to the British Home Guard during WWII. I'll just find a photo you can compare it to. Here is a wiki entry on the Ross too. A late relative of mine used a Ross whilst serving in the British army. I'm not sure if it was during his prewar service in the West Yorkshire Regiment, or during his WW2 service with the Royal Engineers, but he distinctly mentioned the Ross rifle to me on many occasions. I can imagine that they would have been issued to regular troops as a stop-gap measure after the fall of France when weapons and equipment were in short supply. I've no idea when they would finally have been withdrawn from Army use, but I'd guess 1942-3 at the latest.